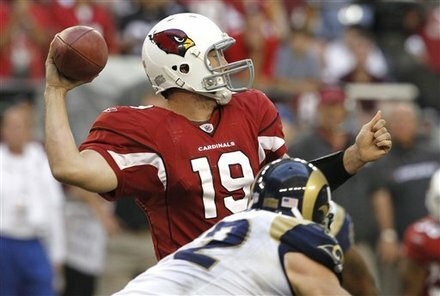 Skelton or Anderson, Who Starts at QB for the Cards Sunday? There’s not much drama about the Cardinals this season, sitting at 3-9 about the only storyline left is who starts at QB this Sunday when the team hosts the Broncos. Coach Ken Whisenhunt still hasn’t made his mind up about who is going to start, as the decision seems between inept Derek Anderson and rookie John Skelton. Anderson though missed another practice Thursday because he had not been cleared to participate after a concussion sidelined him late in Sunday’s 19-6 loss to St. Louis. So it seems the decision is Skelton, or the team can go with a total curveball and start newly signed Richard Bartel, who the team inked this week after he was Daunte Culpepper’s backup for Sacramento of the UFL. Skelton made his NFL debut in the fourth quarter against the Rams. Whisenhunt said Anderson “definitely still is in the mix” to be in the lineup Sunday.